Throwing the weights, putting the stone, hammer throwing and the caber toss conjure up images of burly men, especially those who participate in the Scottish Highlands games. For the second year, the Blaine County Scottish Cultural and Heritage Festival will include the games, music and demonstrations of the Gaelic-Scottish culture, which also includes men in kilts. 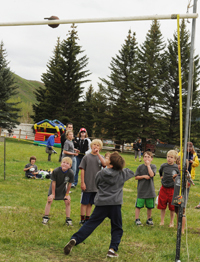 The festival will take place Saturday, June 18, beginning at 9 a.m. at Nelson Field in Hailey. Admission is $10 and free for kids with P.A.L., the Police Activities League. Supported by the Blaine County Sheriff's Office and the Hailey Chamber of Commerce, the festival will benefit the Blaine County P.A.L. program. Highland games, pipe music and dance demonstrations, family-friendly activities and a variety of food options will be available. Events will include a Battle of the Valley, a valleywide city challenge that will include representatives from each city within BlaineCounty. They will have the opportunity to win a traveling trophy and medals. Other highlights will include dance, pipe and drums demonstrations and a law-versus-fire competition. The law-versus-fire competition will be traditional Highland game events including throwing the weights, putting the stone, hammer throwing and the caber toss. The festival will also include an amateur Highland Games competition with the traditional events as well. Turner said the festival will bring something to the Hailey area as well as help out kids in the community. Turner said kids activities will include mini caber, hammer tosses and weight throwing as well as an obstacle course.